As marketers, we tend to group people into neat little boxes (that’s technically what segmentation is, right?). Of these segments, no generation has been more clearly defined as millennials, although Gen Z is catching up. But the measure by which we define millennials — age — is rarely questioned. For years now, millennials have been identified as 18- to 34-year-olds. But, that age range has shifted, now indicating that they fall in between the ages of 22-37. After we released the Hispanic Millennial project, however, we realized that breaking millennials up into two cohorts, ages 18-24 and 25-34, gave us a different perspective as these two sub-cohorts had more differences than similarities. We have run a vast number of segmentations based on the theory that younger millennials are distinct from their older millennial counterparts. We’ve also been able to explore other demographic cohorts outside of Hispanic millennials to reveal more insights into Asian and African-American millennials. One recent study conducted among younger (18-24) and older (25-34) African-American millennials yielded interesting results about one of our most basic needs: water. We saw a stark difference in beverage consumption patterns between older and younger African-American millennials. The most significant difference is how much water they consume daily. 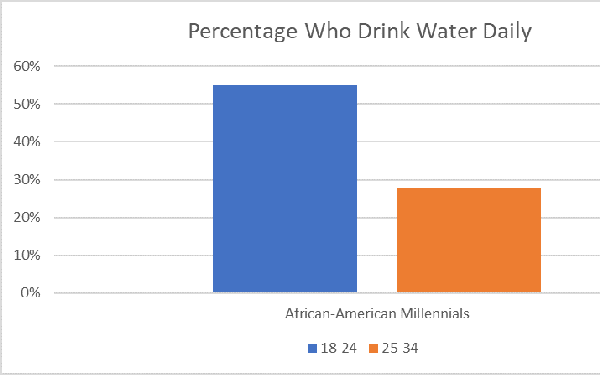 African-American millennials ages 18 – 24 consumed two times more water than older African-American Millennials. 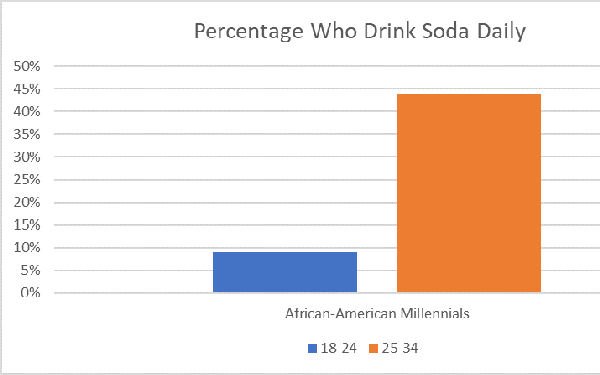 Digging deeper into beverage consumption patterns, we saw that the inverse was true for soda consumption: Only 9% of younger African-American millennials consume soda daily vs. a whopping 44% of older African-American millennials. While these differences seem superficial on the surface, they provide useful insight into intergenerational differences among African-American millennials. These variances point to a rapidly evolving view of health and wellness. Soda for older African-American millennials has become as routine as coffee consumption. But for younger African-American millennials, raised in a “sugar-aware” culture, drinking soda is a rare occasion, as active lifestyles necessitate beverages that are portable and non-perishable, and support an active lifestyle. We see some of this reflected in the spike in sales of bottled water. Big soda companies have also reacted to this trend. Coca-Cola launched Life, its low calorie cola using stevia and cane sugar over high fructose corn syrup, and its new campaign to attract millennials back to Diet Coke through the “Like What You Like” campaign. Not to mention its thriving Dasani water beverages. Soda companies’ response to the tidal wave of water products washing away at their market share could benefit from delving deeper into intergenerational differences among millennials. While they’ve been investing significantly in the growing bottled water market, there is still an opportunity to grow share among older millennials who still consume soda on a regular basis. Understanding these nuances can lead to more targeted campaigns that refrain from brushing broad strokes across generations and get at what makes sub-generations unique.